You are invited to join the Milwaukee County Zoo in celebrating its 125th Anniversary! The Zoo has been part of the Milwaukee community since 1892, and has a myriad of exciting promotions and events planned throughout the upcoming year to celebrate. In 1892, the Milwaukee County Zoo started as a miniature mammal and bird display in Milwaukee's downtown Washington Park. 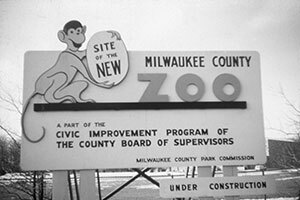 The Zoo later expanded to 23 acres and acquired 800 animals, eventually becoming an entity of the Milwaukee County Park Commission. This gave the Zoo the resources it needed to grow and prosper, and in 1958, the Zoo moved to its present location on 200 acres of beautiful parkland, where currently over 3,300 animals – representing 374 different species – reside. Today, the Milwaukee County Zoo is an accredited institution of the Association of Zoos and Aquariums (AZA), and ranks among the top zoos in the nation. The Zoo has become increasingly involved in the propagation and conservation of endangered species, and currently participates in several significant breeding programs, including bonobos, Grand Cayman blue iguanas and Humboldt penguins. The Milwaukee County Zoo serves not only as a site for special events, holiday celebrations, summer concerts and temporary exhibits, but as a resource to educate, entertain and inspire. We hope to see you in 2017 at the many events celebrating this important milestone!